The S3BGNT18 is a bandgap voltage reference which is able to provide custom temperature independent voltage in range from 0 to 1.2V (more outputs are supported with step 50mV). The S3BGNT18 is a standard implementation using NPN bipolar devices in Brokaw bandgap structure. The deepnwell option is required. The block also provides Proportional to Absolute Temperature (PTAT) current reference. The reference contains slope and absolute voltage trimming which allows to obtain accuracy down to 0.25% at ambient temperature and 0.6% over temperature range if two temperature point trimming procedure is followed (0 and 70 degrees). The S3BGNT18 has been implemented on standard 180nm TSMC logic process with mandatory Deep-Nwell option. However, it is readily portable to any similar manufacturing process. Any activity of this nature can be fully supported. 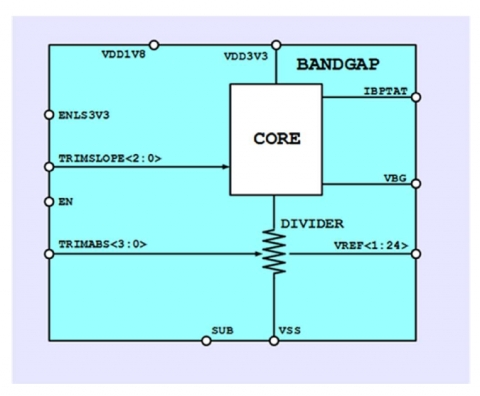 Bandgap is optimized for low noise applications. Each reference output can be loaded by capacitance up to 1pF.